Martin Slevin notched from the spot as Racing Club Warwick won 4-0 at Paget Rangers. Manager Scott Easterlow hailed his side’s “best team performance of the season” after Racers’ first away game in a month ended in a comprehensive 4-0 success. 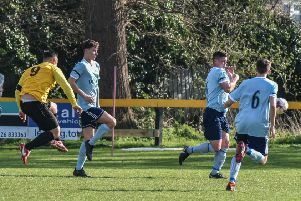 Goals from Joe Carter, Martin Slevin, Luke Cole and Sean Kavanagh lifted Racers to eighth in the Midland League Division One and Easterlow admitted it could have been even more comfortable. Racers, who struggled to overcome Rangers 1-0 at Townsend Meadow earlier in the season, settled first on the artificial surface and both Cole and Kavanagh hit the bar inside the opening ten minutes. The visitors had another effort cleared off the line before a pinpoint Slevin corner picked out Cole to fire home in the 38th minute. Debutant Jamie Coleman, was a commanding presence alongside Marc Passey at the back and it was the former Coventry United man’s delightful through ball that set Carter racing through to double Racers’ lead in the 57th minute. Kavanagh got the third after an Alex Price assist and the game was wrapped up when Slevin tucked away a penalty after Adam Knight’s goalbound header struck a defender’s hand. Easterlow paid tribute to new signing Coleman and said the benefits of strong competition for places would be evident as the season progresses. “Coleman went straight into the starting line-up and his experience was evident early on, just organising people,” he said. “He will be invaluable to us. He was bit rusty in areas but that’s to be expected. It’s just about getting him games now and we’ll reaps the benefits. “It signalled the end of a tough few weeks and we have won three games on bounce, making it only one loss in seven. “We know we have people back from injuries and suspensions now and we have obviously added a couple players too, so we will have plenty of options moving forward. “We’re going to need them. We’re still in every competition and sooner or later if that continues the games will stack up and we will need everyone to play a part. “Other than one more player who was always going to be hard to sign I now have the squad I wanted in the summer when I first took the job so there will be no excuses if we don’t perform on the pitch.